This is the 2nd to the last major update for Version 1.0 of SeriousMD. Yes, it’s finally come to that point. We’re running out of version numbers with all these releases. Seriously, the app is now so far from what it was when we first released it. A lot of the things in the app now were not even considered in the original design. That’s why we’re re-imagining what SeriousMD should be for Version 2.0. Well, let’s just say that we have something big in store for you to help you optimize your workflow even more. Anyway, here’s what’s included in this MAJOR update. You asked for it, now it’s here! We’ve been working on this for a long time and it’s finally out. Today, you can now enable access to your sub-users on iOS and enable permission limits. 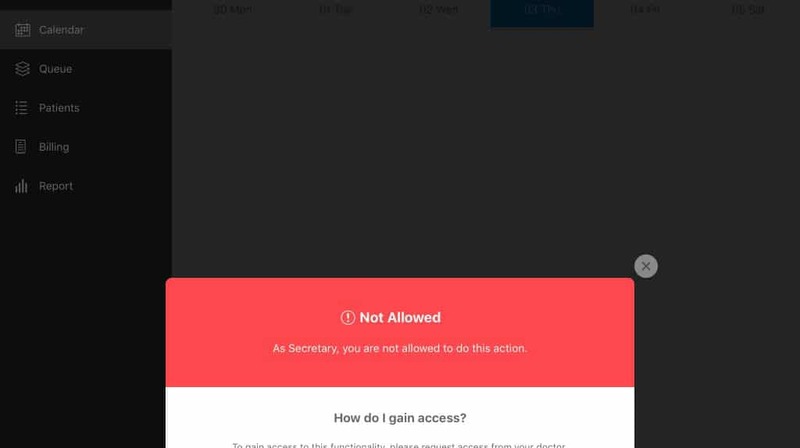 Don’t want your secretary to have access to the notes? Done! Don’t want your nurse to have access to appointments? Done! Customize it the way you need it to fit your process in the clinic! Best of all? If you lose internet, you can keep the data on the iOS device and sync it once the internet is back on. That’s less loading time you have to deal with on the browser. BAM! It’s a great compliment to the previous two releases. There are a ton of things added to the calendar but we’ll just mention the main ones you’ll care about. Your calendar can now start at the time you want. You can add color to your events! Filter what you only want to see on your calendar. Don’t want to see your clinic schedule but just see patient appointments and events? Done! Just uncheck it in the Settings. Do you run your practice strictly with time blocks? Noticed that our calendar couldn’t accommodate 5 minute (or so) time blocks? Starting with this update, you can now adjust that to fit how you run your practice! Your queue will now shower you with colors! Did you already customize your “reasons for visit” in the settings? Today, you can add color to each one. 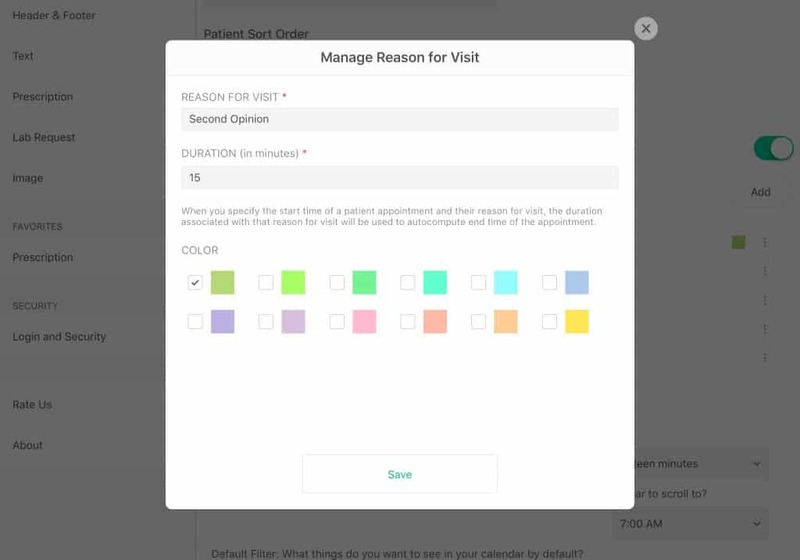 It will help you easily classify patient visits just by looking at the color. Might not seem useful right now, but just try it, you’ll love it. It’s finally here! Print it out and attach it when it’s needed. We improved printing with custom headers and footers last time but omitted the RX sign due to time constraints just so we could release it in time. Today, we’ve brought it back. Your prescription favorites are a mess…not anymore! Today, it’s alphabetically organized. Shoutout to Doc Glenn Guevara for this request. I have to admit, this is weird, but somebody asked for this. You can now print your own blank prescriptions and write on it when you want to. On to the next BIG one and it’s a BIG one as it’s the final release before we release Version 2 of SeriousMD. You have to admit, there’s no platform out there that’s like SeriousMD. Support us, share the word, scream it out loud. Every doctor should be using SeriousMD in 2018! We need more doctors to use SeriousMD in order to release updates that require more processing power. If you do any sort of research, you’ll love it once we can release what we have in store for you, so PLEASE don’t stop inviting more doctors. Be sure to show your love for SeriousMD. Join and invite doctors to the secret group! It won’t take more than 1 minute to share your experience to other doctors still on the edge or just cannot decide. This entry was posted in Roadmap and tagged seriousmd update. Bookmark the permalink.